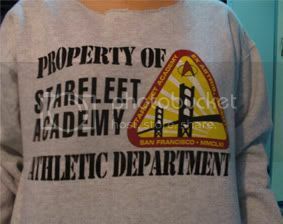 I bought this mainly to make my Trekkie (yeah yeah, Trekker!) brother jealous. I think I've worn it in public, maybe... once. Never worn it since moving to S'pore. Non-Trek fans will just think it's sad. I had a Math teacher who thought it was cool. Figures. the 3rd grade shirt looks like it fits better.